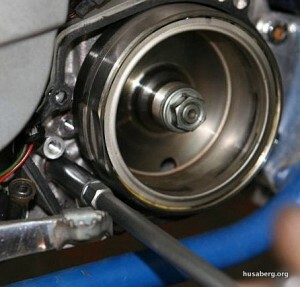 This information for servicing and preventative maintenance is generally accepted for all Husaberg motorcycles. 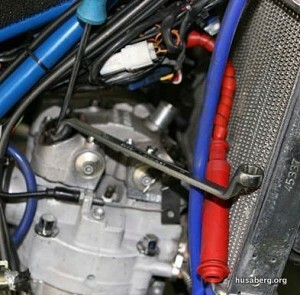 If you’re racing your Husaberg, adjust every second ride. Take the rocker caps off and remove the plug, next, put the bike into second/third gear and then turn it over via rolling it along the workshop. When both sets of tappets are closed (wait for the inlets to close-now stop! 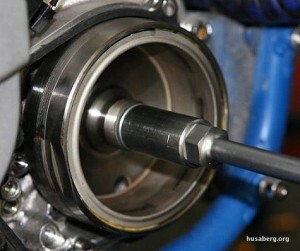 ): use a rod through the plug hole to try and make sure that the piston is as near to TDC as you can get. Slip back into neutral and put back on the stand. 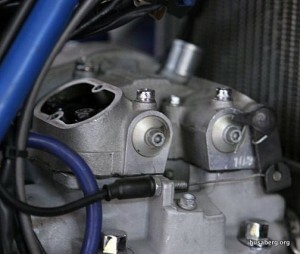 The alternative way is to keep the bike on the stand and remove the ignition cover then turn the engine with a 17mm spanner and again stop the piston at TDC. 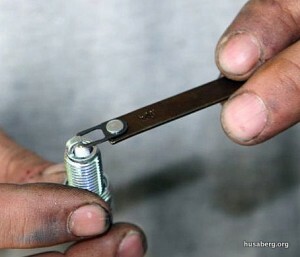 Undo both tappets together and loosen, then adjust gently you should feel the screwdriver tighten “lightly” with your finger tips and from here back-off 1/8th-of-a-turn (or try joeUSA’s tool) and hold tight whilst tightening the lock nut. Check it again and if the 1/8th-turn is less: actually turn the screwdriver back against the nut slightly as you’re locking. Tools required include #4 and #5 allen keys, flat blade screwdriver, stepped 10mm spanner, feeler gauges and an allen screw to lock the crank. Special screw for locking the crank. Turn the engine using a T-bar to TDC. The T-bar controls the violent urge of the engine to roll with the cam’s flanks. It can only be controlled with strength! 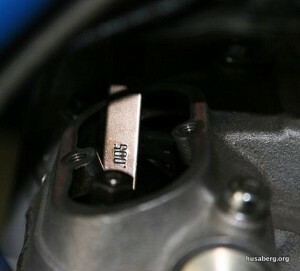 Use the special screw to lock the crankshaft. Now you’re definitely at TDC!!! Time to reverse all the processes: rocker covers on! If racing change every ride or second ride. A good 5/50w synthetic. 900cc for me. Delo 400 is very highly recommended after extensive testing (Lineaweaver). Not necessary for 4 or so rides. 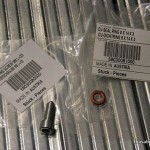 See Metal Filters in the Better than New section. As per conditions. In dust, 2 hours and you’d benefit from a back-up. Makes a nasal roar. Pads last a long time. 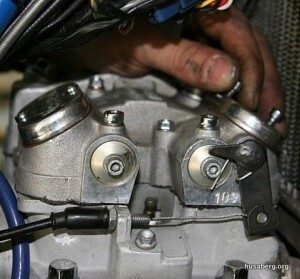 Performance goes off slightly as they get over 1/2 worn, adjust lever out. Not too bad. Can reverse front sprocket. 13T eat your front chain guide up though! Difficult to fit. Put grease on all four rubbers. Replaced. Mine stretched or broke easily. Check regularly. Air in them. 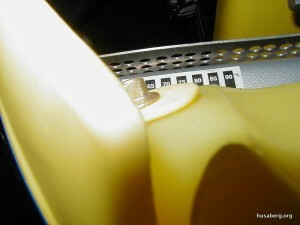 Should bleed Phillips screws immediately after a ride. Wheel free first. Worn once maybe even twice per season. From alloy to SS spacers? I pull the inner bearing seals out and re-grease. Maybe good for two seasons. 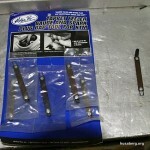 Metal filings – clean carefully. This is how you check if you have the ‘big C’ in your ‘big H’! Difficult. 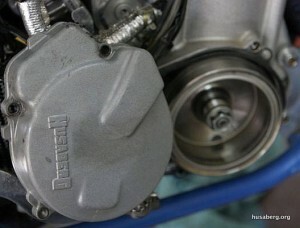 Try a new pad or a plate put in to keep piston back, bleed upwards. Excessive blowing if stuck open. 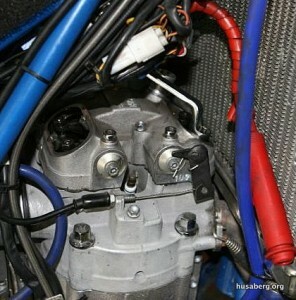 Undo 2-screws inside engines LHS. Clean reed and loctite (Simon). Reverse bleed. From bottom up, using a KTM syringe. Mineral oil only or the seals fail. Easy way to check. Fit a McMaster Carr temperature strip. Easy way to check. Fit a McMaster Carr temp strip. Goes dry, wears rapidly. 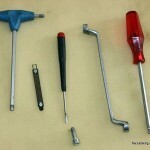 Remove dowel on the bench, clean and repack with grease. Go dry and corrode. Pull rubber sleeves back and copper grease once per year.